It’s been a while since I’ve done any tire reviews, but the last 3 weeks on a 4.8 folding bead 120 TPI Snowshoe XL studded tire impressed me enough to spend some time writing a review. I bought this tire last spring for $99 and it is available in a variety of places online as well as ebay, just make sure you get the 120 TPI version and not one that has a wire bead. For a 4.8 inch tire with 240 studs and 120 TPI the price just can’t be beaten. The only other studded fat tire I have tested extensively is the Dillinger 4 which works well, but I have lost about 25% of the studs in the Dillinger tire after a year of serious abuse. I hope that I don’t have the same problems with this Vee Rubber tire. I tested this tire for 3 weeks on the front of my Boris X9 with a broken frame and a 60 amp Ludicrous BBSHD on a variety of conditions and surfaces from glare ice to packed and loose powder. The tire did very well in all conditions except when the snow got to be over 3 inches deep and cold, then it started to struggle to track properly. Powder – 4 : While the Snowshoe XL does well when the snow is wet, crunchy or hard, it struggles when there are several inches of freshies and the temps stay cold. I ended up keeping a front Surly Bud rim and the Snowshoe XL studded tire and would swap back and forth based on the conditions. Mud – 4 : The only mud I plowed through was icy cold puddles and creeks with this tire, but it seemed to do well. The lugs are small enough not to collect mud but big enough to provide decent traction. This tire is directional but not labeled as such. I liked it better when the steeper side of the lug was set to provide traction and faced the rear of the bike. Ice – 4.5 : I was surprised how well the XL studded tire did on ice and hardpack, even when there was a hard surface crust it would break through and track well. Singletrack – 4 : I often use studded tires on singletrack because the studs do a great job of holding tight on wet logs which is what I seem to have the most problems with. The disadvantage, of course, is that you have less traction on rocks, especially wet rocks. I rode the Dillinger 4 for 2 years on the trail and about 20% of the studs are now missing. So far with several months on the XL studded (only on snow) I have yet to throw a single stud. Time will tell how well these studs hold up. Road – 3.5 : Not really a road tire unless your road is covered with snow and ice. Rolling Resistance – 3.5 : Very little rolling resistance for a tire this fat with studs. Shocking really. 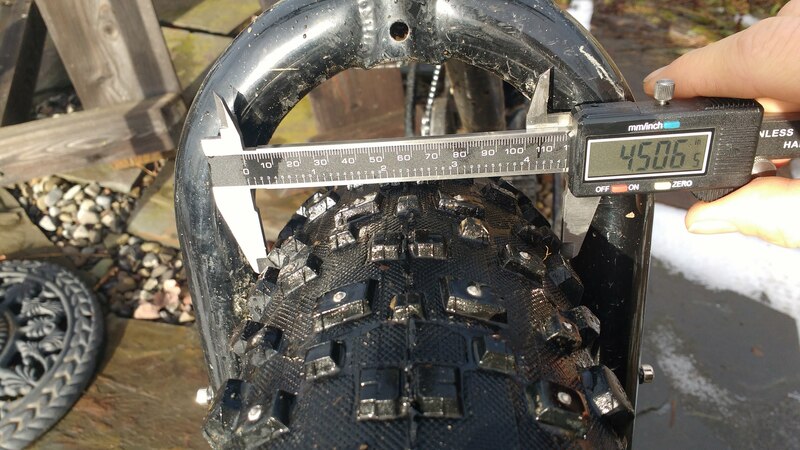 Weight – 3 : Less than you would expect for a studded tire this size. While initially, I was a little put off by this tire in deep, cold fluffy powder, this tire grew on me as the season progressed. Late winter it seemed like it was all I was riding whenever it was time to grab a front tire. The reality of the situation is that if your rear tire slips out on the ice you can usually get a foot out to catch yourself, even at high speeds. If the front tire spits out on ice you’re flat on the ice before you know what hit you. 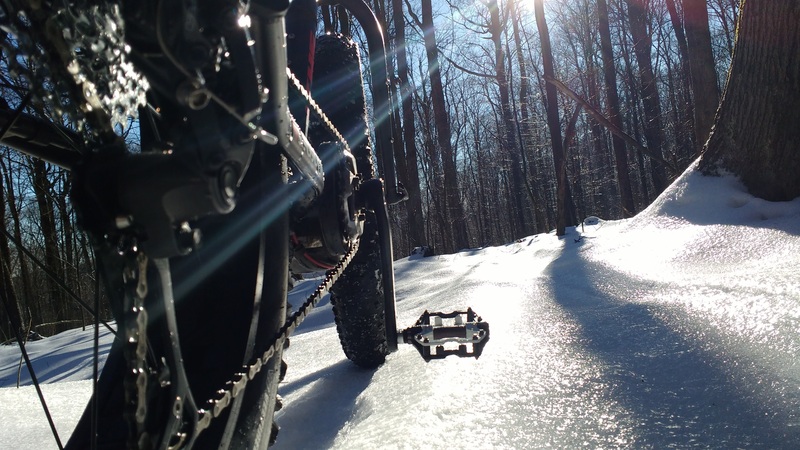 The studs on the snowshoe XL were big enough and numerous enough that I felt confident riding my ebike on wet glare ice. I could not say that I had that level of confidence with the Dillinger 4 studded tire I used last winter. 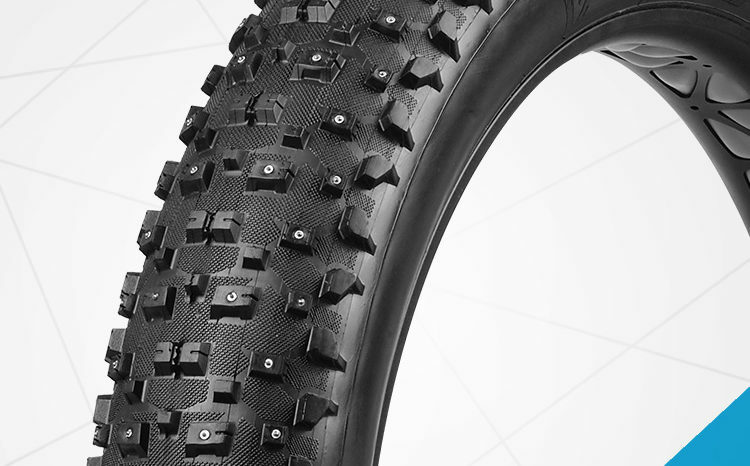 Bottom line is that if you’re looking for a fat tire for marginal and late season conditions, you can’t really go wrong with the Snowshoe XL studded tire, especially at this price range. For around $125 street price per tire it’s like you get the studs for free. Free studs, just what every woman wants. I run these too, and really like them. I wound up adding more studs. I studded every other on center lugs, both tires, not really needed but climbs ice better and tracks better on ice. Louder. Seemed to improve wear rate of those lugs, the are lasting pretty well with mixed pavement use. I think the studs help protect the rubber, less scrubbing wear. On the front I studded the outer rows of lugs, too. This causes the front grip to increase in a washout on ice, while rear grip falls off as the bike leans. The benefit is that I can more easily catch a slip and recover. The downside is that the tire tends to grab the edges of narrow tracks more, and pull me off the line. I just used a Dremel with a drill bit to drill the holes for the new studs. Stuck them in the holes with a hand insertion tool, both from 45N. Now they are really sweet ice tires. Really enjoyed the article, I am interested in fatbiking and I’m trying to gain information from here, very fresh and a great source of knowledge. Really needed tips for fat bike riders. Thanks!